Big gardens are becoming more and more of rarity and let’s be honest we can’t all afford acres and acres of space that we have dreamed of for years to grow plants and have a huge garden capable of yielding lots of fruit and veg. 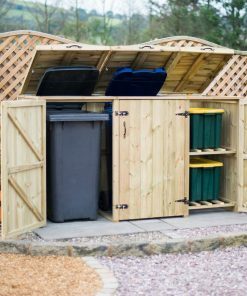 However you do not need a huge amount of space to grow a vast amount of food, especially if you use play it smart and use the right techniques, There are several different ways to increase productivity within your garden so that it is food filled for most of the year. Just because your garden has limited floor space doesn't mean it's the end of the world, the sky is the limit so think about planting crops that grow upwards, this frees up more space on the ground. You can use trellis or even a pallet garden to free up space for other crops. You can try pole beans instead of bush beans is a good idea. As well as staking up cucumbers and tomatoes or put them on vines and trellis. You need to think logically anything you can train to grow vertically you can grow on your fence and wall space. This allows more space on the floor for growing other crops such as potatoes. If you are growing vegetables in good soil then you can grow them a lot closer together than you might think. The spacing recommended on the seed packaging is often very generous. In a limited space you can actually cramp fruit and veg together, it might sound counter intuitive but in many cases it's beneficial as it actually helps control weeds by shading them out. It's always best to grow vegetables in a bed, that way you can set them out in staggered patterns this allows closer spacing whilst still providing each plant with enough room for its roots. Remember that soil must be extremely fertile to enable you to plant densely, if you try it and your plants aren't looking great then try using some liquid fertiliser to give them a boost. You can also thin plants if they're struggling. Over time the quality of your soil increases as you are adding compost and other natural nutrients that are created over time, this will allow you to grow more plants more closely packed together. Many gardeners don't realise that some combinations of vegetables work well together and can share the same garden space. Aim to partner plants that occupy different root zones or mature at different times together. Something that works well is lettuce because it has small roots and grows quickly; try pairing it with a deep rooted vegetable. The lettuce will have been harvested and gone by the time the other crops need that space. Never plant lettuce alone it is just a waste of space. Don't waste time on plants that don't produce at the quantities or at the speed you require. For example a patch of lettuce will provide lots of salad in comparison to something like a radish. To maximise space you will need to avoid wasting space on the types of crops that you won’t use; you should be looking to sow smaller quantities of quick maturing vegetables at 2-4 week intervals. This method allows you to ensure you do not have too much of one vegetable at any given time. It's tempting after a summer of gardening to leave your garden for a bit and not plant anything new. Although the UK isn't the ideal climate you should be able to plant a few vegetables for winter harvest immediately after your spring crops are finished. Peas, radishes and lettuces are usually exhausted by mid-July, this makes it perfect time to sow hardy greens in your garden. A top tip is be ready to fill any gaps in your garden immediately, you can do this by keeping a small area in one of your beds as a seedling nursery. Vegetables like cauliflower or corn leave empty spaces in the bed as they are harvested one by one. You can fill these spaces with veg such as such as lettuce, and other plants that are already in your bed. 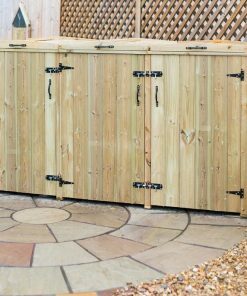 What tips do you have to maximise space in your garden?